You may recall that in a previous life I wrote for the now-deceased TUAW. In 2009, I wrote a short diatribe detailing my hatred for the Apple TV. At this point, the Apple TV was 2 1/2 years old, and I had struggled with it for about a year. If my memory is correct, that piece grew to be one of the most popular things I ever wrote; clearly, the frustration resonated with many others. I don’t say this to toot my own horn but rather to calibrate your understanding of how bad the Apple TV really was. I’m happy to say that I love my Apple TV at this point. Previously, I predicted that the Apple TV would be a failure and that, as a result, Apple would not return to the living room. I was right about it being a failure, but I was wrong about Apple’s intentions for the living room. In 2010, Apple released a brand new Apple TV. It was so radically different from the previous generation that no one would recognize them as the same product. The 1st generation Apple TV was, essentially, a Mac. It used a processor borrowed from the MacBook line, and its case possessed an obvious resemblance to the Mac Mini of the day. It had a dedicated NVIDIA GPU not found in lower-end Macs, but I think it was made of doo doo butter because it was completely pointless. Additionally, the 1st generation Apple TV ran a custom version of Mac OS X v10.4 Tiger, which did make for some interesting hacks. With all of this great Mac technology, one might think it would have been a great product. However, it was ultimately a disappointment. With the release of the 2nd generation Apple TV, it was clear that Apple went back to the drawing board because they scrapped everything and started fresh. The 2nd generation Apple TV was pretty much an iPhone 4. For starters, it used the same custom silicon, the A4 chip, which served double duty as both the CPU and the GPU. Further, its operating system was actually a custom build of iOS 4. The initial setup was still less than awesome. There was no way to avoid the hunt-and-peck keyboard facilitated by the Apple remote. You had to use it to configure your Wi-Fi and log in to your iTunes account. However, if you have the latest Apple TV and an iOS 7 device, you can complete both of those tasks just by touching the two devices together. Personally, I have never set my Apple TV up this way because Apple introduced this feature after my initial setup. I haven’t needed to reconfigure my network or iTunes account since. [amazon template=amazon embed&asin=B00GDME9P6]Content on today’s Apple TV is superior in every way when compared to the first few iterations. Besides getting content directly from Apple (more on this later) or on YouTube, there is a long list of online services to enable including my personal favorites: Netflix, HBO GO, and Hulu. There’s also ESPN, NFL Now, and other sports-oriented services. Sure, none of these is free, but if you’re serious about cutting the cord with your cable provider, you already know that. With apps like iFlicks and AirParrot, it’s easy to get your own content on the Apple TV as well… even if you acquired it through less than legitimate means (ed – we don’t condone this type of behavior). One of the major gripes I had with the original Apple TV was the video quality of iTunes purchases/rentals. The 2nd/3rd generation Apple TV, however, doesn’t suffer from any of those same faults. Apple serves high-definition movies in glorious 1080p resolution (when available, natch) and the 5.1 Dolby Surround tracks are never disappointing. Apple hasn’t convinced me to pay around $15 for a movie that I can’t hold in my hands, but I am a huge fan of renting movies with my Apple TV. Sure, at five bucks, it’s more expensive than going to the nearest Redbox, but the convenience and value is unbeatable. Especially when compared to the cost of seeing that movie in a crowded theater which smells of popcorn and teenage angst. You should know that I am mental about video and audio quality — my favorite way to watch a movie is with my D-ILA projector aimed at the 120-inch screen in my dedicated theater with electrostatic loudspeakers. That is to say, I’m more particular now than I was in 2009. Even still, today’s Apple TV does a phenomenal job showcasing my favorite movies and TV shows. I would even go as far to say that most people could not find a difference between a movie on an Apple TV versus that same movie on Blu-ray other than being amazed at how the movie actually starts when you press play on the remote. It truly speaks volumes about the success of Apple’s work over the last 5 years that the 2nd generation Apple TV was able to vastly outperform its predecessor. They made this possible by using an extremely lightweight operating system and custom-designed hardware tailored specifically for the kinds of things Apple TV was intended to do. Some might disagree with my assessment by pointing to Moore’s law as the explanation. While I don’t doubt it was a contributing factor, the 2nd generation Apple TV simply could not exist without iOS and Apple’s A4 chip. 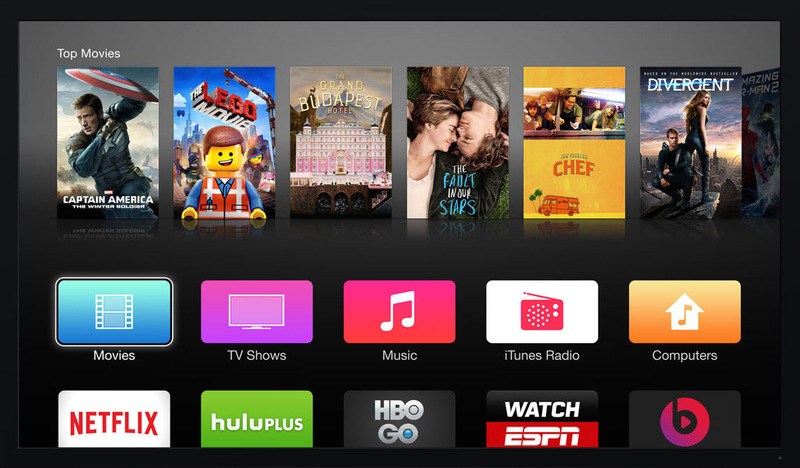 Today, the Apple TV is on its second revision of its 3rd generation (confusing much? ), and the formula hasn’t really changed much. It’s basically an iPhone 4S running iOS 8. Given that the actual iPhone 4S is showing its age, it seems reasonable that an Apple TV update is imminent. The “lowest” SoC (system on a chip) in Apple’s purchasable lineup is the A6 (excluding the A5 powering the Apple TV). Since Apple still considers the A6 current, it could probably provide three more years of life to an Apple TV. Here’s where it gets crazy–for both the 2nd and 3rd generations, Apple used a SoC that was two years old. If we look back two years to 2013, that is the year Apple released the A7 chip that powered the iPad Air and the iPad mini 2 with their incredible retina displays. While the A7 might be overkill for today’s HD content, it could be exactly what we need for tomorrow’s 4k content. Many are clamoring for Apple to release a dedicated television to replace the Apple TV. As someone who dearly loves his Apple TV as much as every other piece of equipment in his home theater, I truly hope they ignore such demands and continue the march of iterative improvements to what is already an amazing Apple product. Aron was born in Texas and never plans on leaving. Despite a Windows-only childhood, he purchased an iPod (his other MP3 players all failed) and quickly learned of the greatness of Apple hardware and software. He currently spends his days working for an energy company specializing in financial management software. In his free time Aron can be found reading the latest news, watching his latest Blu-ray purchase, or occasionally posting to this site. Passionate about technology, automotive culture, and the many communities around them, he also enjoys photography and is a self-diagnosed HD-addict.